Here is the translation of Pope Francis’ address before and after the recitation of the Angelus today in St. Peter’s Square. This Sunday’s Gospel (Luke 9:51-62) contains a very important passage about the life of Christ. It is the moment in which, as St. Luke writes, “Jesus resolutely determined to journey to Jerusalem” (9:51). Jerusalem is the final goal, where Jesus, at his last Passover, must die and rise again, and in this way carry out his mission of salvation. Categories: From the Bishops and the Pope | Permalink. How does the Holy Spirit effect, affect our lives? That answer is entirely up to you. How open are you to the teachings of our faith? How open are you to live out our faith? Congratulations for those who are receiving the sacrament of Confirmation this weekend. Confirmation is not just another graduation. It is an invitation to live the Catholic life to actually practice the faith and believe what our faith teaches. By today’s standards, most of the faithful do not know much about what the Church teaches. Do you? There is so much to learn. Unfortunately, there are many people with opinions out there that are trying to get your attention to pull you away from your faith. The irony of it all is that many Catholics go to those sources to learn more about the faith and avoid reading up on the church documents themselves or listen to a credible source. 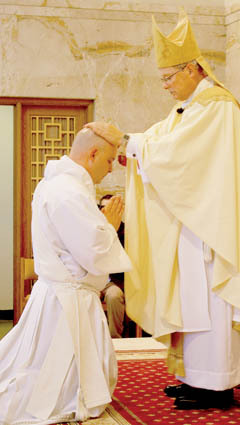 ROCKFORD—Bishop David J. Malloy used a story from the Gospels to instruct two men — Ryan Brent Browning and Manuel Gerardo Gomez-Reza — as they were about to be ordained to the priesthood during the ordination Mass on June 22 at the Cathedral of St. Peter. The Apostles — “the first priests,” Bishop Malloy said, were invited to accompany Jesus in the boat after he had driven a legion of demons out of a man. The freed man asked to join them, but Jesus instead sent him home to his family. Categories: From the Bishops and the Pope, News | Permalink. Pope Francis reflected on the difference between a Christian “of words” and a Christian “of actions” during his homily this morning at Mass in the chapel of Domus Sanctae Marthae. Continuing his catechesis on the Creed, Pope Francis spoke on the Church as the temple of the Holy Spirit during his weekly General Audience held in St. Peter’s Square today. The image of the temple, he said, conjured images of the great Temple of Solomon in Jerusalem which enshrined the Ark of the Covenant. ROCKFORD, IL—Bishop David J. Malloy, Bishop of the 11 county Catholic Diocese of Rockford, issued the following statement today after the United States Supreme Court released its decision on the constitutionality of the Defense of Marriage Act. “Today’s Supreme Court ruling in United States v. Windsor, which challenged the constitutionality of the Defense of Marriage Act, is a tremendous misstep for the direction of our country.